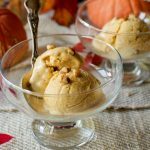 Pumpkin Ice Cream with Toasted Pecans is a piece of pumpkin pie combined with pecan pie, only without the crust, the best of both desserts in a no-churn form. Toast the pecan pieces in 1 Tablespoon of butter. Let cool. Mix the pie filling, the sweetened condensed milk, pumpkin pie spice, and cinnamon liqueur in a bowl and chill. Whip the cream in the chilled bowl with the chilled beaters until you get stiff peaks. Do not over beat. Using the same beaters slightly whip the chilled pumpkin ingredients. Fold the pumpkin ingredients into the whipped cream. Don't mix! Fold! Once it is thoroughly combined add the toasted pecans.